We have already represented the North Kerry line in this series, but another station will not come amiss, especially as elevations of the main building are to hand. Abbeyfeale station opened with the rest of the Newcastlewest-Tralee section on Dec. 20th, 1880. The original plan was for a single platform, but by July 1881, the station was re-modelled with a passing loop and second platform to make it suitable for crossing passenger trains. 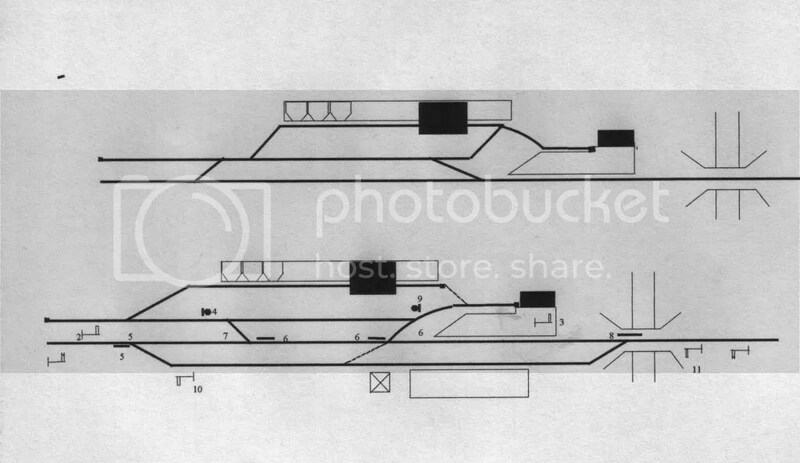 The station had a 293’ long down platform (with a 3,530 gallon water tank), 224’ up platform, carriage dock, a long shunting road and a crossover from the goods store to the platform road. In 1881, it acquired a Gloucester Carriage & Wagon Company signal cabin. In GSR days, staffing consisted of a station-master, clerk, two signalman, checker, porter and a guard. As with many smaller Irish stations, it really came to life for livestock traffic. Typically, for Abbeyfeale fairs, ten wagons were supplied in advance, with a special of another ten to twenty from Limerick about 7am, and a loaded train back to Limerick about 2pm. For bigger fairs, Limerick sent down a special of twenty-five wagons the day before, with the engine stabled at Listowel overnight, and in the morning, there was a special from Tralee of fifteen wagons and a buyers’ coach, and for the main Autumn fairs, which might generate three specials, there was an empty train of twenty wagons train from Limerick about 7am in the morning. If anyone wants a narrow gauge feeder, they can employ a little modeller’s licence, and conjecture that one of the numerous still born plans spawned by the 1883 Tramways Act had proved more successful. In 1884, the Abbeyfeale & Brosna Tramway was promoted to run south from Abbeyfeale, with baronial guarantees from Glenquin in Limerick and Trughenacmy in Kerry, and in 1885 the Limerick & Kerry Light Railways and Tramway Company, prepared Bills for both Abbeyfeale-Brosna and Listowel-Ballybunion schemes. None of these ideas seems to have progressed beyond the planning stage. The broad gauge line lost its passenger services in 1963, and Abbeyfeale closed to all traffic in November 1975, but the building is well maintained as a private residence with the water tower and platforms intact. The goods store still stands but when I walked through in 2002 was labelled “dangerous” and the roof was beginning to decay. The town lies to the south. At the west (Tralee) end of the station, the line crossed the road north to Athea by a girder bridge, and then ran along an embankment, to cross the Oolagh River by a steel girder bridge with 40’ span, which could provide some scope for scenic modelling, and where open-plan baseboards might help. Details of North Kerry line locomotives, rolling stock and timetables were given in New Irish Lines, Nov, 2000. There are photographs in the O’Dea Collection in the National Photographic Archive of Ireland and Adrian Vaughan’s collection. Abbeyfeale station above as opened, below as modified to be suitable for passing passenger trains, 1881: later additional trackwork shewn in broken lines. Line to Limerick and Newcastlewest to left of both drawings; line to Tralee to right. The elevation, plan and section are from GSWR 8″:1′ scale architectural drawings, courtesy of the IRRS.